You've probably been thinking about getting your first apartment in Chico or Redding for awhile now and have an idea of the kind you want to live in. Maybe it’s spacious with plenty of natural light, has a view of the pool, is surrounded by beautiful gardens, and has a large balcony where you can entertain on a warm summer evening. Pop! That was the sound of your bubble bursting. While it’s great to envision the kind of place you want to live in, odds are that your first apartment will not be the home of your dreams. You can know for sure by starting out with a budget. Grab a pencil, paper, calculator and know how much you make each month. It’s important to be realistic with your budget. If you're looking to see if you can afford a nicer place then see about cutting that extra trip to the mall or all those Starbucks runs before work. Allow yourself some wiggle room though - it’s never a good idea to have your budget be tight every single month because you over estimated your finances. Now it’s time to crunch some numbers. The numbers will determine where you start looking. If you have your heart set on the kind of apartment you daydreamed about above, or at least are willing to live with someone in order to afford a nicer place, consider whether or not you will have a roommate. There are pros and cons to roommates. The biggest pro is that the more roommates you have the bigger the budget you have to work with. Part of the first apartment experience is that it can be really fun living with a friend and making some memorable moments. On the other hand, there's always the possibility that difficult issues will come up, especially if you're living with someone you don’t know well. Figure out if you can live with a stranger or require someone you already know. This will determine how you begin your search for the right one. Once you’ve made your decision make sure you interview the person you’ll be living with and set ground rules before moving in. Communication is key to being able to live with someone. Make sure you start it out right by getting all those pesky questions out of the way first. This is impossible. Really, no apartment – especially a first apartment – will have everything you desire. So, with this mindset, instead find an apartment in Chico or Redding that you can picture yourself being happy in. Before starting your search, know the things that are really important to you and what you’re willing to compromise on. If you have decided to have a roommate see if you can get a list of the things that are important to them as well. The happier both of you are at the beginning the better! Only look in the areas of town where you feel safe and only look at the places that are within your price range. Nothing is sadder than looking through all these dream apartments and then seeing that they're just way out of your budget. It will save you from the temptation of believing you can stretch your budget. Don’t fall for it, you don’t want to be spread too thin. Remember, it’s a good idea to leave yourself a little wiggle room. Be sure to take tours of multiple apartments, know the conditions of the rental contract, and pay attention to your gut feeling! Before moving in, you’ll want to make sure you have the items you use every day. Dishes and a fully-stocked fridge is a good place to start. You’ll want to keep your apartment clean, so cleaning supplies would be good to have on hand too. Do you have furniture? You’ll need that if you don’t want to have a picnic in the living room every night or want to camp on the floor in a sleeping bag. If you aren’t a DIY kind of person, you’ll probably learn to become one in your first apartment so invest in a handy toolbox for those times little things just need fixing. Decorating is always a fun task when moving into your first apartment, but save that for last. Make sure you've purchased all the essentials before deciding to go all out on the decorations. Once you get everything moved in, it’s time to play house! Setting up your apartment and decorating it just the way you want it can be very rewarding. You have completed all the different steps to get to this place, now it’s time to celebrate by making your place feel like home. You can get some great finds at yard sales and local thrift stores, or find ways to re-purpose the hand-me-downs you got from friends and family. It can be fun to take something old and make it new and totally you. Figure out what you want to make, pull out your laptop, and search for the perfect DIY videos online. DIY-ing may take more time but it can save you money in the long run and you get to brag about it when people ask you where you got it! Not exactly sure how to decorate? Try deciding on a theme that can be seen throughout the apartment. 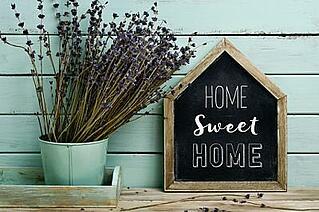 Whatever you do, make sure your first apartment is a place that you look forward to coming home to. Moving into a new apartment in Chico or Redding can be exhausting and leave your head spinning, wondering what you need to do next. Hopefully this "My First Apartment Checklist" makes your first apartment searching experience a good one!